I developed this world with NTT and Tower Records. Visitors can use listening stations which are linked to Tower Records' music database for artist info and listening to cuts from CDs as well as purchasing music via the linked Tower Records' website. The space provides streaming audio and video using NTT's software vision and audio link media technologies and has a room where streaming video is mapped onto the walls. 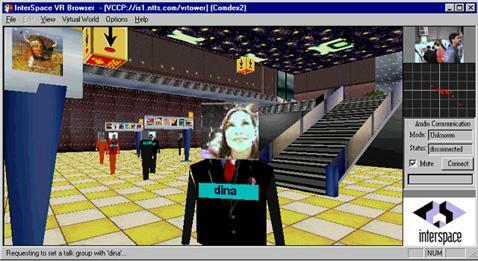 I redesigned this world for NTT and Tower Records in 1998 and produced the project. 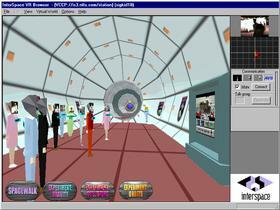 I developed InterSpace Station with colleagues at NTT to continue to explore distance learning within virtual worlds. 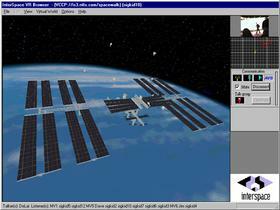 InterSpace Station includes an exterior model of the International Space Station and six companion worlds which allow high school students to collaborate and conduct physics experiments. A NASA ISS engineer and a NASA computer scientist met with students in these worlds to discuss the assembly of the ISS and the kinds of computers used aboard space shuttle and ISS missions. InterSpace Station is an ongoing project of NTT Interactive and was exhibited at SIGGRAPH 98 in Orlando, Fl as part of the sigKIDS pavillion. Click here to visit NTT's InterSpace Station web site.